"Stinging nettle" redirects here. For the Australian plant, see Urtica incisa. For other plants that sting, see Stinging plant § Plants with stinging hairs. Urtica dioica, often known as common nettle, stinging nettle (although not all plants of this species sting) or nettle leaf, or just a nettle or stinger, is a herbaceous perennial flowering plant in the family Urticaceae. Originally native to Europe, much of temperate Asia and western North Africa, it is now found worldwide. The species is divided into six subspecies, five of which have many hollow stinging hairs called trichomes on the leaves and stems, which act like hypodermic needles, injecting histamine and other chemicals that produce a stinging sensation upon contact ("contact urticaria"). The plant has a long history of use as a source for traditional medicine, food, tea, and textile raw material in ancient societies. Urtica dioica is a dioecious, herbaceous, perennial plant, 1 to 2 m (3 to 7 ft) tall in the summer and dying down to the ground in winter. It has widely spreading rhizomes and stolons, which are bright yellow, as are the roots. The soft, green leaves are 3 to 15 cm (1 to 6 in) long and are borne oppositely on an erect, wiry, green stem. The leaves have a strongly serrated margin, a cordate base, and an acuminate tip with a terminal leaf tooth longer than adjacent laterals. It bears small, greenish or brownish, numerous flowers in dense axillary inflorescences. The leaves and stems are very hairy with non-stinging hairs, and in most subspecies, also bear many stinging hairs (trichomes or spicules), whose tips come off when touched, transforming the hair into a needle that can inject several chemicals causing a painful sting or paresthesia, giving the species its common names: stinging nettle, burn nettle, burn weed, or burn hazel. U. dioica subsp. dioica (European stinging nettle), from Europe, Asia, and northern Africa, has stinging hairs. U. dioica subsp. galeopsifolia (fen nettle or stingless nettle), from Europe, does not have stinging hairs. U. dioica subsp. afghanica, from southwestern and central Asia, sometimes has stinging hairs or is sometimes hairless. U. dioica subsp. gansuensis, from eastern Asia (China), has stinging hairs. U. dioica subsp. gracilis (Ait.) Selander (American stinging nettle), from North America, has stinging hairs. U. dioica subsp. holosericea (Nutt.) Thorne (hoary stinging nettle), from North America, has stinging hairs. Other species' names formerly accepted as distinct by some authors but now regarded as synonyms of one or other subspecies include U. breweri, U. californica, U. cardiophylla, U. lyalli, U. major, U. procera, U. serra, U. strigosissima, U. trachycarpa, and U. viridis. Urtica dioica is considered to be native to Europe, much of temperate Asia and western North Africa. It is abundant in northern Europe and much of Asia, usually found in the countryside. It is less widespread in southern Europe and north Africa, where it is restricted by its need for moist soil, but is still common. It has been introduced to many other parts of the world. In North America, it is widely distributed in Canada and the United States, where it is found in every province and state except for Hawaii, and also can be found in northernmost Mexico. It grows in abundance in the Pacific Northwest, especially in places where annual rainfall is high. The European subspecies has been introduced into Australia, North America and South America. In Europe, nettles have a strong association with human habitation and buildings. The presence of nettles may indicate the site of a long-abandoned building, and can also indicate soil fertility. Human and animal waste may be responsible for elevated levels of phosphate and nitrogen in the soil, providing an ideal environment for nettles. Nettles are the exclusive larval food plant for several species of butterflies, such as the peacock butterfly, comma (Polygonia c-album), and the small tortoiseshell. It is also eaten by the larvae of some moths including angle shades, buff ermine, dot moth, the flame, the gothic, grey chi, grey pug, lesser broad-bordered yellow underwing, mouse moth, setaceous Hebrew character, and small angle shades. The roots are sometimes eaten by the larva of the ghost moth Hepialus humuli. Stinging nettle is particularly found as an understory plant in wetter environments, but it is also found in meadows. Although nutritious, it is not widely eaten by either wildlife or livestock, presumably because of the sting. It spreads by abundant seeds and also by rhizomes, and is often able to survive and re-establish quickly after fire. Urtica dioica produces its inflammatory effect on skin (stinging, burning sensation often called "contact urticaria") both by impaling the skin via spicules – causing mechanical irritation – and by biochemical irritants, such as histamine, serotonin, and choline, among other chemicals. Anti-itch drugs, usually in the form of creams containing antihistamines or hydrocortisone, may provide relief from nettle dermatitis. In Great Britain, the use of dock leaves on nettle stings is an established folk remedy, and revolves around the sap released from rubbing the leaf over affected areas of skin, which provides a cooling sensation. Docks and nettles regularly grow in the vicinity of each other due to both plants favouring the same soil conditions, and this may have aided the dock's popularity as a treatment for nettle stings. The term, contact urticaria, has a wider use in dermatology, involving dermatitis caused by various skin irritants and pathogens. In Great Britain and Ireland, the stinging nettle (U. dioica subsp. dioica) is the only common stinging plant and has found a place in several figures of speech in the English language. Shakespeare's Hotspur urges that "out of this nettle, danger, we pluck this flower, safety" (Henry IV, part 1, Act II Scene 3). The figure of speech "to grasp the nettle" probably originated from Aesop's fable "The Boy and the Nettle". In Seán O'Casey's Juno and the Paycock, one of the characters quotes Aesop "Gently touch a nettle and it'll sting you for your pains/Grasp it as a lad of mettle and soft as silk remains". The metaphor may refer to the fact that if a nettle plant is grasped firmly rather than brushed against, it does not sting so readily, because the hairs are crushed down flat and do not penetrate the skin so easily. In the German language, the idiom sich in die Nesseln setzen, or to sit in nettles, means to get into trouble. In Hungarian, the idiom csalánba nem üt a mennykő, the thunderbolt does not strike into nettle, means bad people escape trouble or the devil looks after his own. The same idiom exists in the Serbian language - неће гром у коприве. In Dutch, a netelige situatie means a predicament. In French, the idiom faut pas pousser mémé dans les orties (don't push grandma in the nettles) means that we should be careful not to abuse a situation. The name urticaria for hives comes from the Latin name of nettle (Urtica, from urere, to burn). The English word 'nettled', meaning irritated or angry, is derived from 'nettle'. There is a widespread idea in Great Britain that the nettle was introduced by the Romans. The idea is mentioned by William Camden in his book Britannia 1586. However, in 2011, an early Bronze age burial cist on Whitehorse Hill, Dartmoor, Devon was excavated. The cist dated from between 1730 and 1600 BCE. It contained various high value beads as well as fragments of a sash made from nettle fibre. It is possible that the sash was traded from mainland Europe, but also that it was locally made. The young leaves are edible and can be used as leaf vegetable, as with the purée shown in the above image. U. dioica has a flavour similar to spinach mixed with cucumber when cooked, and is rich in vitamins A and C, iron, potassium, manganese, and calcium. Young plants were harvested by Native Americans and used as a cooked plant in spring when other food plants were scarce. Soaking stinging nettles in water or cooking removes the stinging chemicals from the plant, which allows them to be handled and eaten without injury. After the stinging nettle enters its flowering and seed-setting stages, the leaves develop gritty particles called cystoliths, which can irritate the urinary tract. In its peak season, nettle contains up to 25% protein, dry weight, which is high for a leafy green vegetable. The leaves are also dried and may then be used to make a herbal tea, as can also be done with the nettle's flowers. Nettles can be used in a variety of recipes, such as polenta, pesto, and purée. 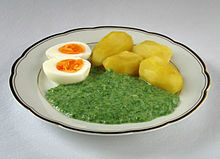 Nettle soup is a common use of the plant, particularly in Northern and Eastern Europe. Nettles are used in Albania as part of the dough filling for the börek. The top baby leaves are selected and simmered, then mixed with other ingredients such as herbs and rice, before being used as a filling between dough layers. Similarly, in Greece the tender leaves are often used, after simmering, as a filling for hortopita, which is similar to spanakopita, but with wild greens rather than spinach for filling. In the UK, an annual World Nettle Eating Championship draws thousands of people to Dorset, where competitors attempt to eat as much of the raw plant as possible. Competitors are given 60 cm (24 in) stalks of the plant, from which they strip the leaves and eat them. Whoever strips and eats the most stinging nettle leaves in a fixed time is the winner. The competition dates back to 1986, when two neighbouring farmers attempted to settle a dispute about which had the worst infestation of nettles. Nettle leaves are steeped in a concentrated sugar solution to extract the flavour. The leaves are then removed and a source of citric acid (usually lemon juice) is added to help preserve the cordial and add a tart flavour. Commercially produced cordials are generally quite concentrated and are usually diluted by one part cordial to ten parts water – thus a 0.5 l (0.11 imp gal; 0.13 US gal) bottle of cordial would be enough for 5.5 litres (1.2 imp gal; 1.5 US gal) diluted. The high concentration of sugar in nettle cordial gives it a long shelf life. U. dioica herb has been used in the traditional Austrian medicine internally (as tea or fresh leaves) to treat disorders of the kidneys and urinary tract, gastrointestinal tract, locomotor system, skin, cardiovascular system, hemorrhage, influenza, rheumatism, and gout. Urtication, or flogging with nettles, is the process of deliberately applying stinging nettles to the skin in order to provoke inflammation. An agent thus used is known as a rubefacient (something that causes redness). This is done as a folk remedy for treatment of rheumatism. In Ecuador there are indigenous healers that use stinging nettles with the belief that they improve fatigue and circulation, by rubbing raw leaves or flogging the plant directly on the body. Historically, nettles have been used to make clothing for 2,000 years, and German Army uniforms were almost all made from nettle during World War I due to a potential shortage of cotton. More recently, companies in Austria, Germany, and Italy have started to produce commercial nettle textiles. The fibre content in nettle shows a high variability and reaches from below 1% to 17%. Under middle-European conditions, stems yield typically between 45 and 55 dt / ha (decitons per hectare), which is comparable to flax stem yield. Due to the variable fibre content, the fibre yields vary between 0.2 and 7 dt / ha, but the yields are normally in the range between 2 and 4 dt / ha. Fibre varieties are normally cloning varieties and therefore planted from vegetative propagated plantlets. Direct seeding is possible, but leads to great heterogeneity in maturity. Fresh leaves contain approximately 82.4% water, 17.6% dry matter, 5.5% protein, 0.7 to 3.3% fat, and 7.1% carbohydrates. Mature leaves contain about 40% α- linolenic acid, a valuable omega-3 acid. For exact fatty acid contents see Table 1. Seeds contain much more fatty acid than leaves. Table 1: Fatty acid content of different plant organs of U. dioica. Standard deviations are given in brackets. Minerals (Ca, K, Mg, P, Si, S, Cl) and trace elements (Mn, Cu, Fe) contents depend mostly on the soil and the season. Carotenoids can be found primarily in the leaves, where different forms of lutein, xanthophyll and carotene are present (Table 2). Some carotenes are precursors of vitamin A (retinol), their retinol equivalents RE or retinol activity equivalents per g dry weight are 1.33 for mature leaves and 0.9 for young leaves. Nettle contains much less than carotenes and retinol than carrots, which contain 8.35 RE per g fresh weight. Depending on the batch and the leave and stem content, nettle contains only traces of zeaxanthin or between 20 – 60 mg / kg of dry matter. Nettle contains ascorbic acid (vitamin C), riboflavin (vitamin B2), pantothenic acid, vitamin K1 and tocopherols (vitamin E). The highest vitamin contents can be found in the leaves. Table 2: Carotenoid concentration of leaves of U. dioica (μg/ g dry weight). In laying hens, nettle can be used as an egg yolk colorant instead of artificial pigments or other natural pigments (derived from marigold for yellow). Nettle has high carotenoid contents, especially lutein, β-carotene and zeaxanthin, of which lutein and zeaxanthin act as yellow pigments. Feeding as little as 6.25 g dry nettle per kg feed is as effective as the synthetic pigments to colour the egg yolk. Feeding nettle has no detrimental effect on the performance of the laying hens or the general egg quality. Ruminants also avoid fresh stinging nettles, however if the nettles are wilted or dry, voluntary intake can be high. Dry nettle shoots are said to be “as good as good alfalfa hay”. As with other leafy herbs with relatively hard stems, the harvest should be done carefully to avoid leave drop losses. Nettle can be conserved as hay or silage. Nettles contain nitrogenous compounds, so are used as a compost activator or can be used to make a liquid fertilizer, which although low in phosphate, is useful in supplying magnesium, sulphur, and iron. They are also one of the few plants that can tolerate, and flourish in, soils rich in poultry droppings. The stinging nettle is the Red Admiral caterpillar's primary host plant and can attract migrating Red Admiral butterflies to a garden. U. dioica can be a troubling weed, and mowing can increase plant density. Regular and persistent tilling will greatly reduce its numbers, and the use of herbicides such as 2,4-D and glyphosate are effective control measures. Three cultivation techniques can be used for the stinging nettle: 1) direct sowing, 2) growing seedlings in nurseries with subsequent transplantation and 3) vegetative propagation via stolons or head cuttings. Direct sowing: The seedbed should have a loose and fine structure, but should be reconsolidated using a packer roller imminently prior to sowing. Sowing time can be either in autumn or in spring. Seed density should be 6 kg/ha with row spacing of 30 centimetres (12 in) and 42–50 cm in autumn and spring, respectively. The disadvantage of direct sowing is that it usually leads to incomplete plant coverage. This drawback can be mitigated by covering the seedbed with a transparent perforated foil in order to improve seed germination. Further, weed control can be problematic as the stinging nettle has a slow seedling development time. Growing seedlings: For this technique pre-germinated seeds are sown between mid-/end-February and beginning of April and grown in nurseries. Seedlings are grown in tuffs with 3-5 plants / tuff and a seed density of 1.2-1.6 kg / 1000 tuffs. A fastened germination is achieved by alternating high temperature during daytime (30 °C for 8 h) and lower temperature during nighttime (20 °C for 16 h). Before transplanting, the seedlings should be fertilized and acclimated to cold temperatures. Transplantation should start around Mid-April with row spacing of 42–50 centimetres (17–20 in) and plant spacing within rows of 25–30 cm. Vegetative propagation: Stolons (with several buds) of 10 cm should be planted from Mid-April in a depth of 5–7 centimetres (2.0–2.8 in). Head cuttings are grown in nurseries starting between mid-May and mid-June. Growing tips with two leaf-pairs are cut from the mother plant and treated with root-growth inducing hormones. Transplantation can be delayed in comparison to the growing seedling technique. The stinging nettle can also be grown in controlled-environment agriculture systems, such as soil-less medium cultivations or aeroponics, which may achieve higher yields, standardize quality, and reduce harvesting costs and contamination. Urtica is derived from a Latin word meaning 'sting'. Dioica is derived from Greek, meaning 'of two houses' (having separate staminate and pistillate plants; dioecious). ^ a b c "Urtica dioica L.". Plants of the World Online. Royal Botanic Gardens, Kew. Retrieved 2018-11-14. ^ a b c "Urtica dioica - L". Plants for a Future. 2012. Retrieved 23 April 2018. ^ a b "Burning & Stinging Nettles". University of California. Retrieved 21 September 2013. ^ a b c d "Nettles". Drugs.com. 2009. Retrieved 23 April 2018. ^ Per Brodal (2010). The Central Nervous System: Structure and Function. Oxford University Press US. p. 170. ISBN 978-0-19-538115-3. Retrieved 22 September 2010. ^ Lukešová, Hana (June 2017). "Identifying plant fibre textiles from Norwegian Merovingian Period and Viking Age graves: The Late Iron Age Collection of the University Museum of Bergen". Journal of Archaeological Science: Reports. 13: 281–285. doi:10.1016/j.jasrep.2017.03.051. ^ a b Chen Jiarui; Ib Friis; C. Melanie Wilmot-Dear. "Flora of China online". efloras, Missouri Botanical Garden, St. Louis, MO & Harvard University Herbaria, Cambridge, MA. ^ "Plant For a Future database". ^ "Species: Urtica dioica". United States Forest Service. Retrieved 21 September 2013. ^ "Stinging Nettle". Ohio Agricultural Research and Development Center, Ohio State University. Retrieved 21 September 2013. ^ "Nettles: Bad guys come good". The Telegraph Online. Retrieved 21 February 2019. ^ Smith, Paul L. (2012). Indicator Plants: Using Plants to Evaluate the Environment. p. 47. ^ Heiko Bellmann: Der Neue Kosmos Schmetterlingsführer, Schmetterlinge, Raupen und Futterpflanzen, pg. 170, Frankh-Kosmos Verlags-GmbH & Co, Stuttgart 2003, ISBN 3-440-09330-1. ^ Carey, Jennifer H. (1995). "Urtica dioica". Fire Effects Information System, [Online]. ^ Cummings, Alexander J; Olsen, Michael (2011). "Mechanism of Action of Stinging Nettles". Wilderness & Environmental Medicine. 22 (2): 136–139. doi:10.1016/j.wem.2011.01.001. PMID 21396858. ^ Nettle (Stinging). Wildflowerfinder.org.uk. Retrieved on 3 July 2012. ^ Louis J. Casarett; Curtis D. Klaassen; John Doull (2008). Casarett and Doull's toxicology: the basic science of poisons. McGraw-Hill Professional. pp. 1104–. ISBN 978-0-07-147051-3. Retrieved 22 September 2010. ^ Michael I. Greenberg (4 June 2003). Occupational, industrial, and environmental toxicology. Elsevier Health Sciences. pp. 180–. ISBN 978-0-323-01340-6. Retrieved 22 September 2010. ^ Adisesh, A; Robinson, E; Nicholson, P.J; Sen, D; Wilkinson, M; Standards of Care Working Group (2013). "U.K. Standards of care for occupational contact dermatitis and occupational contact urticaria". British Journal of Dermatology. 168 (6): 1167–1175. doi:10.1111/bjd.12256. PMC 3734701. PMID 23374107. ^ "The Project Gutenberg eBook of The Æsop For Children, by Æsop". Gutenberg.org. 2 December 2006. Retrieved 5 July 2010. ^ Doug (5 September 2010). "Grasping the nettle: an empirical enquiry". Retrieved 6 September 2010. ^ Bárdosi, Vilmos (2012). Magyar szólások, közmondások adatbázisa (Hungarian sayings, proverbs database) (PDF) (in Hungarian). Budapest: Tinta Könyvkiadó. p. 242. Retrieved 16 March 2019. ^ "How did the Romans change Britain?". BBC Guides. Retrieved 2018-08-01. ^ Lodwick, Lisa (2014-04-10). "Roman nettle – Urtica pilulifera". Lisa Lodwick. Retrieved 2018-08-01. ^ "Whitehorse Hill | Dartmoor". www.dartmoor.gov.uk. Retrieved 2018-08-01. ^ "The cist on Whitehorse Hill - Current Archaeology". Current Archaeology. 2016-12-01. Retrieved 2018-08-01. ^ Hughes, R. Elwyn; Ellery, Peter; Harry, Tim; Jenkins, Vivian; Jones, Eleri (1980). "The dietary potential of the common nettle". Journal of the Science of Food and Agriculture. 31 (12): 1279–86. doi:10.1002/jsfa.2740311210. PMID 6259444. ^ 1069 Recetas de Cocina Archived 5 February 2013 at Archive.today (No 423). Wattpad.com (12 May 2010). Retrieved on 3 July 2012. ^ "Lynher Dairies Nettles & Garlic". Lynherdairies.co.uk. Retrieved 5 July 2010. ^ "Gouda Cheese with Stinging Nettles: Cooking Terms". RecipeTips.com. Retrieved 5 July 2010. ^ "Byrek me hithra" (in Albanian). Hermes News. 19 March 2012. Archived from the original on 24 October 2014. Retrieved 14 May 2017. ^ "Byrek me hithra" [Recipe: Nettles Pie] (in Albanian). 13 February 2013. Retrieved 14 May 2017. ^ "What's In Your Horta?". Greek Cooking. GreekBoston. Retrieved 14 May 2017. ^ "World nettle eating championships". BBC News. 17 June 2005. Retrieved 3 July 2012. ^ Langley, William. (14 June 2009) World Stinging Nettle Eating Championship attracts record crowd. The Daily Telegraph (London). Retrieved on 3 July 2012. ^ Andy Hamilton (29 October 2009). "Nettle beer recipe". Selfsufficientish.com. Retrieved 21 September 2015. ^ Vogl, Sylvia; Picker, Paolo; Mihaly-Bison, Judit; Fakhrudin, Nanang; Atanasov, Atanas G; Heiss, Elke H; Wawrosch, Christoph; Reznicek, Gottfried; Dirsch, Verena M; Saukel, Johannes; Kopp, Brigitte (2013). "Ethnopharmacological in vitro studies on Austria's folk medicine—An unexplored lore in vitro anti-inflammatory activities of 71 Austrian traditional herbal drugs". Journal of Ethnopharmacology. 149 (3): 750–771. doi:10.1016/j.jep.2013.06.007. PMC 3791396. PMID 23770053. ^ Westfall, Rachel Emma (2003). "Galactagogue herbs: a qualitative study and review". Canadian Journal of Midwifery Research and Practice. 2 (2): 22–27. ^ "Stinging Nettles". BBC. Retrieved 21 September 2013. ^ Fogle, Ben (2014-08-06). "Ben Fogle's country travels: in my underpants in Ecuador". ISSN 0307-1235. Retrieved 2018-07-25. ^ "Student shows off nettle knickers". BBC News. 1 July 2004. Retrieved 24 May 2010. ^ Neustatter, Angela (27 February 2008). "Rash thinking". The Guardian. ^ Flintoff, John-Paul (20 August 2009). "Second skin: why wearing nettles is the next big thing". The Ecologist. ^ Wurl, Günter; Graf, Torsten; Vettel, Armin; Biertümpfel, Andrea. "10 Jahre anbautechnische Versuche zu Fasernesseln (Urtica dioica L.) in Thüringen" (PDF). Thüringer Landesanstalt für Landwirtschaft. ^ Vogl, C.R; Hartl, A (2009). "Production and processing of organically grown fiber nettle (Urtica dioica L.) and its potential use in the natural textile industry: A review". American Journal of Alternative Agriculture. 18 (3): 119. doi:10.1079/AJAA200242. ^ Piers Warren, 101 uses for Stinging Nettles (2006), p. 65, ISBN 0-9541899-9-X. ^ a b c d e f Lutomski, Jerzy; Speichert, Henryk (1983). "Die Brennessel in Heilkunde und Ernährung". Pharmazie in Unserer Zeit (in German). 12 (6): 181–186. doi:10.1002/pauz.19830120602. ^ a b c d Guil-Guerrero, J.L; Rebolloso-Fuentes, M.M; Isasa, M.E.Torija (2003). "Fatty acids and carotenoids from Stinging Nettle (Urtica dioica L.)". Journal of Food Composition and Analysis. 16 (2): 111–119. doi:10.1016/S0889-1575(02)00172-2. ^ "USDA National Nutrient Database: raw carrot". Retrieved 28 November 2015. ^ a b c d Loetscher, Y; Kreuzer, M; Messikommer, R.E (2013). "Utility of nettle (Urtica dioica) in layer diets as a natural yellow colorant for egg yolk". Animal Feed Science and Technology. 186 (3–4): 158–168. doi:10.1016/j.anifeedsci.2013.10.006. ^ Loetscher, Y; Kreuzer, M; Messikommer, R. E (2013). "Oxidative stability of the meat of broilers supplemented with rosemary leaves, rosehip fruits, chokeberry pomace, and entire nettle, and effects on performance and meat quality". Poultry Science. 92 (11): 2938–2948. doi:10.3382/ps.2013-03258. PMID 24135598. ^ Keshavarz, Mehdi; Rezaeipour, Vahid; Asadzadeh, Sakineh (2014). "Growth Performance, Blood Metabolites, Antioxidant Stability and Carcass Characteristics of Broiler Chickens Fed Diets Containing Nettle (Urtica dioica. L) Powder or Essential Oil". International Journal of Advanced Biological and Biomedical Research. 2 (9): 2553–2561. ISSN 2322-4827. ^ Humphries, D.J; Reynolds, C.K (2014). "The effect of adding stinging nettle (Urtica dioica) haylage to a total mixed ration on performance and rumen function of lactating dairy cows". Animal Feed Science and Technology. 189: 72–81. doi:10.1016/j.anifeedsci.2014.01.006. ^ "Indicator Weeds and Soil Conditions at". Garden-helper.com. Retrieved 5 July 2010. ^ "virtual-herb-walk". Herbalpractitioner.com. Retrieved 5 July 2010. ^ "h2g2 – Stinging Nettles". BBC DNA. Retrieved 5 July 2010. ^ Pears, Pauline, et al. HDRA Encyclopedia Of Organic Gardening, p. 207, Dorling Kindersley Ltd, London, 2005. ^ "Compost Teas vs Other Teas and Extracts". Ciwmb.ca.gov. Retrieved 5 July 2010. ^ Bryant, Simon; Thomas, Chris; Bale, Jeffrey (1997). "Nettle-feeding nymphalid butterflies: Temperature, development and distribution". Ecological Entomology. 22 (4): 390–398. doi:10.1046/j.1365-2311.1997.00082.x. ^ a b Wood Powell Anderson (1999). Perennial weeds: characteristics and identification of selected herbaceous species. Wiley-Blackwell. pp. 25–. ISBN 978-0-8138-2520-5. Retrieved 17 October 2010. ^ Heyland, Klaus-Ulrich (2006). "Ölfrüchte, Faserpflanzen, Arzneipflanzen und Sonderkulturen". Handbuch des Pflanzenbaues. Band 4. ^ a b c d e f g h Bomme, U. (1996). "Kulturanleitung für Brennnesseln". Bayerische Landesanstalt für Bodenkultur und Pflanzenbau, Abteilung Pflanzenbau und Pflanzenzüchtung, LBP Freising. ^ a b c Heeger, E. F. (1956). "Handbuch des Arznei- und Gewürzpflanzenbaus". Leipzig: Deutscher Bauernverlag. ^ a b c Bomme U.; Unterholzerner S (1996). "Günstigste Verfahren zum Anbau der Grossen Brennnessel". Gemüse 3: 233–234. ^ a b c d Dachler M.; Pelzmann H. (1999). "Arznei- und Gewürzpflanzen". Anbau — Ernte — Aufbereitung. 2. Auflage. ^ Pagliarulo, C.L; Hayden, A.L; Giacomelli, G.A (2004). "Potential for Greenhouse Aeroponic Cultivation of Urtica Dioica". Acta Horticulturae (659): 61–66. doi:10.17660/ActaHortic.2004.659.6. Elliott, C. (1997). "Rash Encounters". Horticulture. 94: 30. Wikimedia Commons has media related to Stinging nettle. "Urtica dioica L." Germplasm Resources Information Network (GRIN). Agricultural Research Service (ARS), United States Department of Agriculture (USDA).